I've always been a lover of farmer's markets. But only recently did I make it part of my weekly routine. I can't tell you how glad I am that I've made the switch. I'm inspired by the piles of fresh produce. I find myself buying more fresh vegetables and fruits than ever before. And I'm eating them too! After sampling the great wares available I leave excited to create some great meal highlighting my new found treasure. Below are a few of the reasons I've become such a Farmer's Market fan. If you have reasons of your own, I'd love to hear them. With spring upon us, almost every state in the U.S. has a local outdoor market available to them. I've listed a few web sites related to farmer's markets so you may let your passion for produce guide your next surfing session. Taste: Fruits and vegetables purchased in season at a local farmer's market taste better than the same products purchased at a large grocery store. In addition, fresh foods always taste better than canned, frozen or previously cooked. Nutrition: In most cases fresh fruits and vegetables contain more nutrients than those which have been processed in any way. Canned foods are heated before canning in order to kill off bacteria. Unfortunately this process leeches vitamins and minerals from the product. Health: Fresh fruits and vegetables are a major part of any healthy diet. Five to nine servings per day are recommended by the US Health Department's Food Pyramid guidelines. Local economy: Support your local economy by supporting small producers of great product rather than the large grocery chains who support large producers of only passable product. The experience: No other shopping compares with a walk through an outdoor market. The sites, smells and tastes are fabulous. As a regular shopper you will gain a connection to your community in a unique way. Personal finance: In most cases the prices for locally grown produce are lower than those in a large chain grocery store. This is especially true if you stick to purchasing produce which is in season. 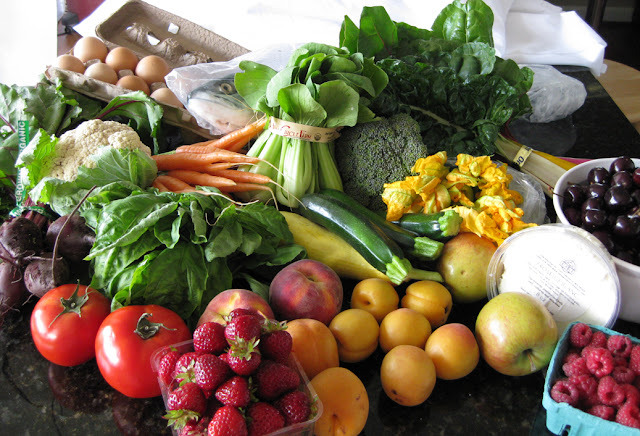 The environment: Organically grown foods are easier on the earth and better for you! 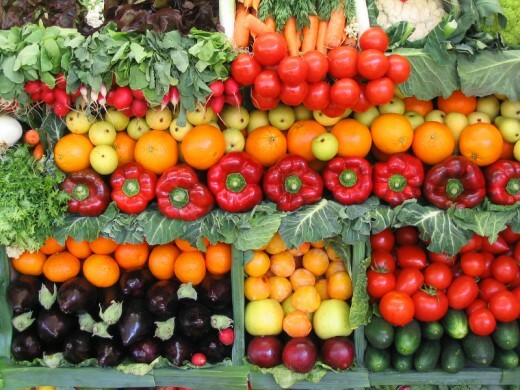 You'll find a great selection of organic produce at your local farmer's market. Connection with the Earth: Exploring the connection between the foods you eat and the Earth is a great way to learn about the diversity of life on this planet. It's educational for the entire family. Exploring how foods are grown, harvested and eaten helps children learn about the processes on Earth which allow abundant growth of foods. Seasonal eating: Eating foods which are in season makes sense. They taste better, are easier to grow, and look beautiful! Knowledge that you're doing the right thing, for you, your family, your community and the Earth!